PORT WENTWORTH, GA – November 16, 2018 –The City of Port Wentworth will soon be home to an exciting new development, sure to draw interstate travelers as well as residents from around the Coastal Empire region. Already replete with an impressive array of dining options, stores, and fuel stops, the community can now add “outdoor destination” to its ever-lengthening list of attractions. Thanks to a unanimous vote by the Port Wentworth City Council on Wednesday night, a Gander Outdoors store will soon occupy a large tract of land off I-95’s exit 109. Gander Mountain declared bankruptcy in May 2017 and was bought out by Camping World, who rebranded it as Gander Outdoors and established a retail network of stores for hunting, fishing, camping, and other outdoor recreation products and services. The 100-acre parcel is bordered by the interstate, Highway 21 and Bojangles chicken. Camping World plans to close its location on Highway 80 in Pooler and reopen as part of the rebranded Gander Outdoors project in Port Wentworth. 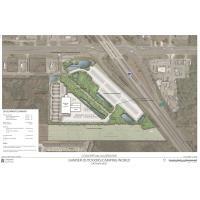 The project will contain a new 47,450-square-foot retail store/sales building, a 14-bay parts and service facility, an RV display area and associated customer parking. Though it has a lot of moving parts, the company is committed to forging ahead with its well-laid plans and intends to break ground in March 2019. The remaining acreage has been inquired about by other retailers and restaurant chains. Colliers International, the brokerage, has a role in the transaction and is handling the remainder of the property for the seller. This project is estimated to have a total investment amount of $13 million, and projected to have $30 million in annual sales revenue. It will be developed in one phase. Gander Outdoors estimates it will employ 90 people, while Camping World anticipates hiring an additional 40 employees. Port Wentworth Chamber of Commerce President and CEO Trisha Growe was pleased that the council expressed support for the project through its vote. Lamar Mercer, Principal/Project Manager with Thomas & Hutton, said his company already was associated with the property through its current owner, Gateway West, so they were able to assist Camping World and Gander Outdoors through due diligence and assessment of the parcel. Mercer thinks having the outdoor recreation company establish such a presence in Port Wentworth will give the community a boost in terms of attracting even more businesses, industry operations and dining establishments. “Having a retailer like Camping World with this much national – and frankly, worldwide – presence be on display at the first entry point into the state is very exciting,” he said. If all goes as planned, the Gander Outdoors project will open in summer 2020.